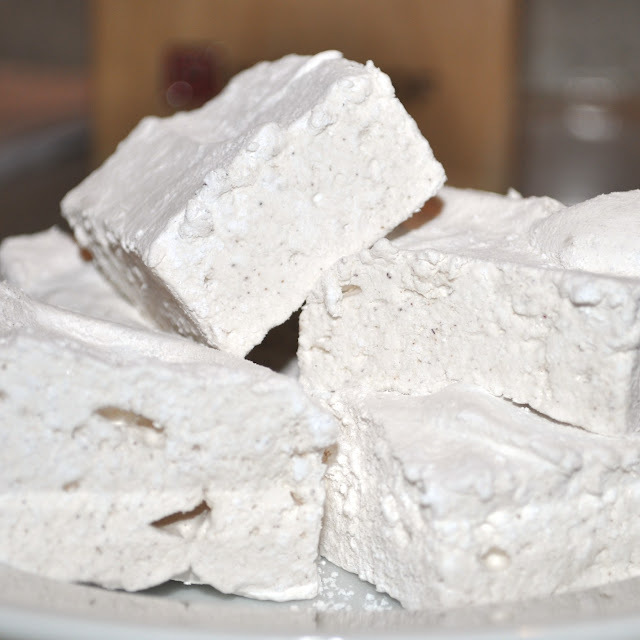 As requested, here's the recipe for homemade marshmallows, adapted from my favorite of favorite cookbooks for sweet treats: Sticky, Chewy, Messy, Gooey: desserts for the serious sweet tooth. Pour 1/2 cup of the cold water into a large mixing bowl or the bowl of a mixer. Sprinkle the gelatin evenly over the water and allow the gelatin to sit and absorb all the water, 45 to 60 minutes. In a large saucepan, combine the remaining 1/2 cup cold water, the granulated sugar, the corn syrup, and the salt. Heat the mixture over medium heat, stirring occasionally until the sugar dissolves. Increase the heat to high and let the mixture come to a boil. Cook the syrup, without stirring, until it reaches 240 degrees on a candy thermometer (or you can eyeball it--basically you want the sugar to get to the soft-ball stage). Do not allow the syrup to go past 244 degrees or the marshmallows will be rubbery rather than tender. Remove the syrup from the heat and slowly beat into the dissolved gelatin with an electric mixer set at low speed. Increase the mixer speed to high and continue beating until the mixture is very thick and white but still warm, about 15 minutes. Beat in the vanilla and cinnamon. Generously dust a 9x13 inch baking pan with cornstarch. Pour the marshmallow mixture into the pan, smooth the top with a spatula, and dust the top liberally with confectioners' sugar. Let the marshmallow stand, uncovered at room temperature, for 8-12 hours to firm up. Turn the marshmallow from the pan onto a sheet of parchment paper liberally dusted with confectioners' sugar. Cut into 20 large squares. Dust each square with more confectioners' sugar. Store the marshmallows in a tightly covered container until ready to serve. Oh my gosh. I hope you love them as much as I do! Need a reminder as to how easy to make and yummy to eat they are? Read the post from last week. Once the cruel, cruel 1st tri ends, I will so be making these! I can tell that deep down I am wanting hot choc & marshmallows, but the wee fetus ain't having it right now. Now I clicked over to the soft-ball stage website and do you know what it reminded me of? Here is your hint: CM. Hahaha! Yay! Thanks so much for posting the recipe! Yum!